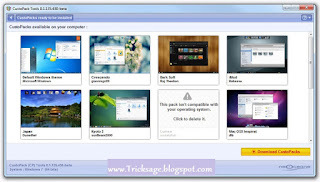 CustoPack Tools is a free software that allows you to easily customize Windows appearance through the installation of packs. Made by the CrystalXP.net team, it is compatible with Windows XP (32-bit), Windows Vista (32 or 64-bit), and Windows 7 (32 or 64-bit). Choose a CustoPack : designed for general public, this part allows you to install a CustoPack (among those you have downloaded and installed) in order to customize the appearance of your Windows. Create a CustoPack : designed for a public more informed, this part allows you to create your own CustoPack with elements which you made or selected. For more information, you can visit our « Creators Room ». Settings and configuration : this part allows you to set CustoPack Tools options and to configure some system options. A CustoPack is a pack containing various graphic elements (icons, cursors, images, visual style, etc.) 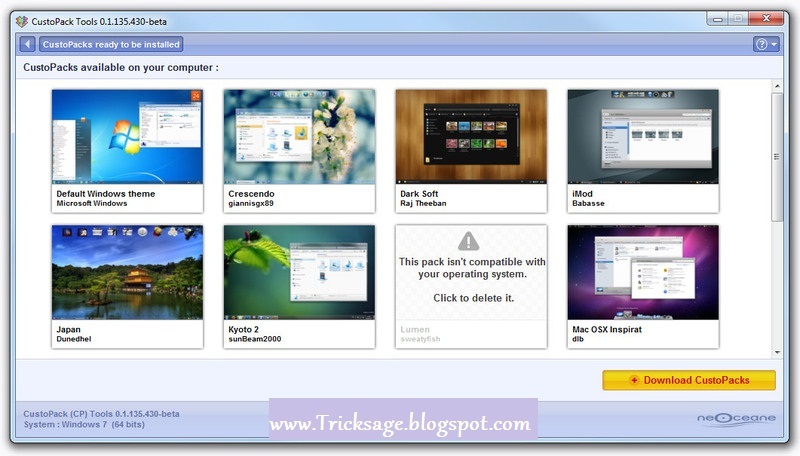 which allows you to change Windows appearance. This pack must be used with CustoPack Tools. It's this software which will take charge of recovering elements contained in the CustoPack so as to install them in your computer. Guys is this is a virus? ?